The fortunes of western civism have been characterized by an accumulation of influences related to individuals, events, and movements that contributed to the development of an aggregate western culture. This aggregate was comprised of philosophical explanations of the spiritual and physical world that included, artistic and aesthetic expressions. In addition, various socio/political concerns were expressed in forms of political rule and trading systems, the rise and fall of empires in an ever-changing social landscape, and moral and ethical practices. Social and cultural changes demanded an ever-increasing need for additional resources that could produce tensions and conflicts within societies that also were reflected in changes in accepted citizenship understandings. 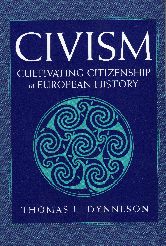 Civism, in conjunction with citizenship, slowly became an educational means of unifying the state, as well as a means for advancing the accepted values of the each political system devised by circumstances that influenced the civic culture.